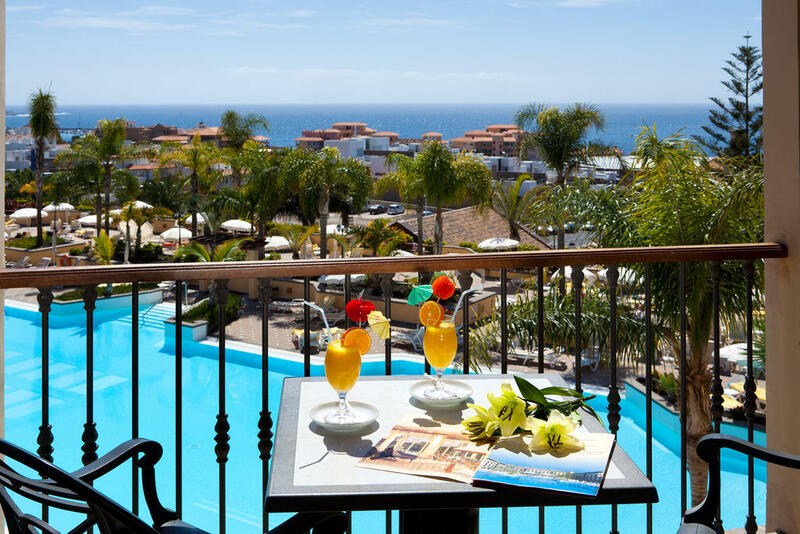 Splendid hotel of 5 *****, inaugurated at the end of December 2001 and located in the residential zone of Costa Adeje. Luminous hall completely surrounded with glass that allow to descry their amplitude from the outside of the hotel. 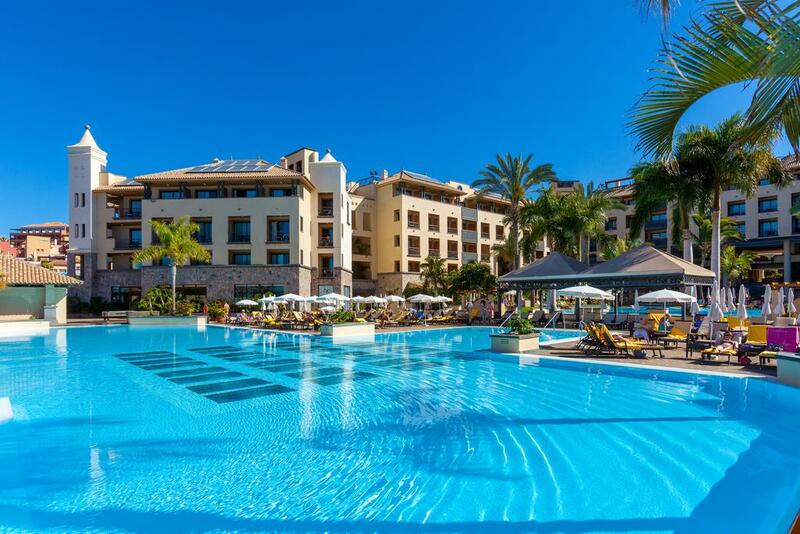 It has an ample solarium of 4.500m² with two great swimming pools for adults and another one for children. 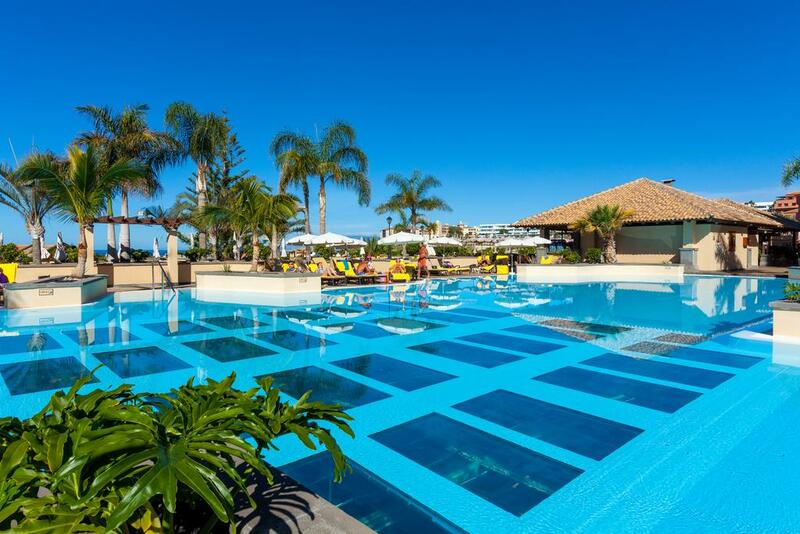 Magnificent swimming pool on the top of the building with a wide solarium, with tekka floor and sunbeds and fascinating views to the sea and the mountain. There are also two special terraces for nudist use only. 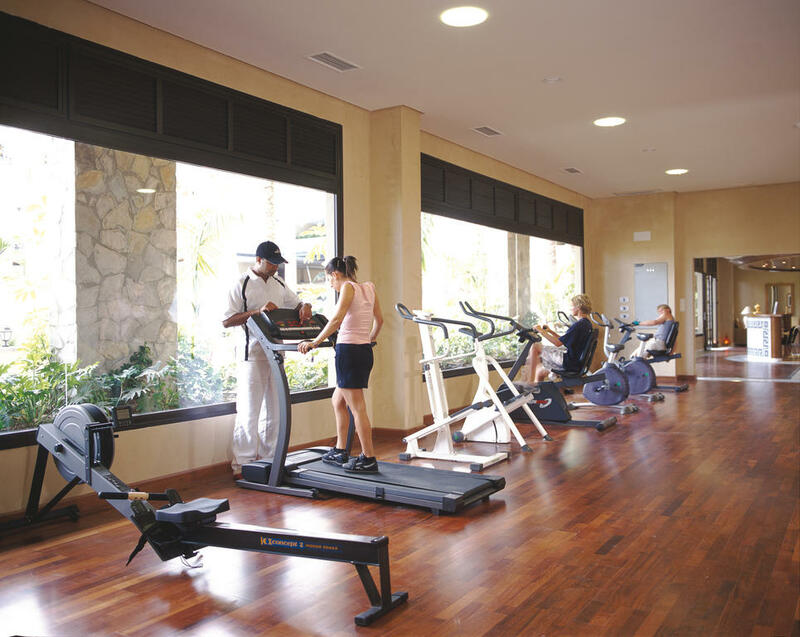 Hotel is perfect not only for holidays, accessible, golf courses but also for business, conventions, incentives, weddings and events. 1,5 km from the Congress Centre "Magma Art & Congresos"
433 DOUBLE ROOMS (also for single use) 40m². 80 of them interconnectings. Two separated beds of 110cm x 200cm or one double bed of 180cm x 200cm and sofa bed for the third person or child. Minimum occupancy: 1 adult; maximum 3 adults or 2 adults + 1 child. 5 ACCESSIBLE ROOMS for reduced mobility, with similar characteristics than the other ones above, but with facilities as “Roll in Shower”. 14 SENIDOR SUITES 60m². Beds of 200cm x 200cm. Separated living room, hydro massage bath and two balconies. Minimum occupancy two adults, maximum two adults and child. 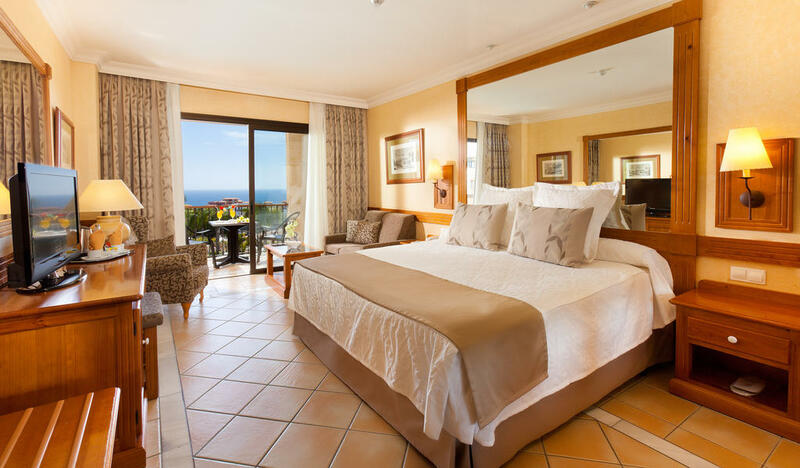 4 ROYAL SUITES 130m². 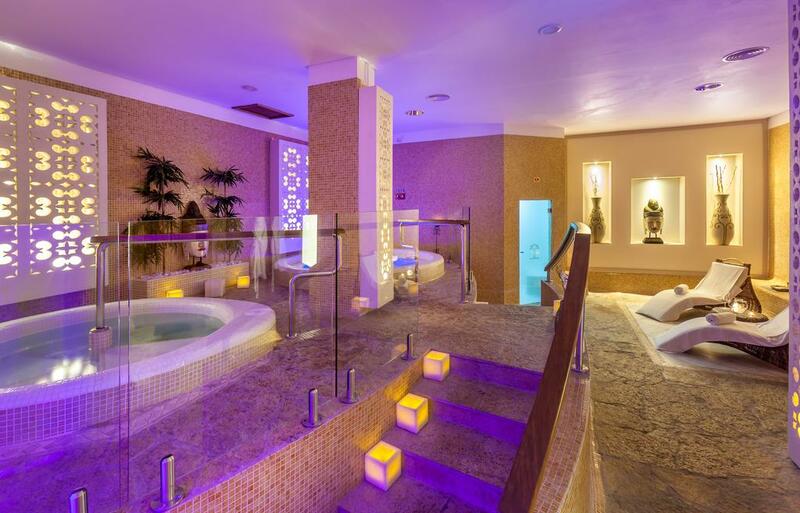 Two rooms with balconies, bath with hydro massage and a magnificent hall with terrace and tekka sun beds. Minimum occupancy 4 adults, maximum 4 adults and two children. 1 IMPERIAL SUITE 170m². 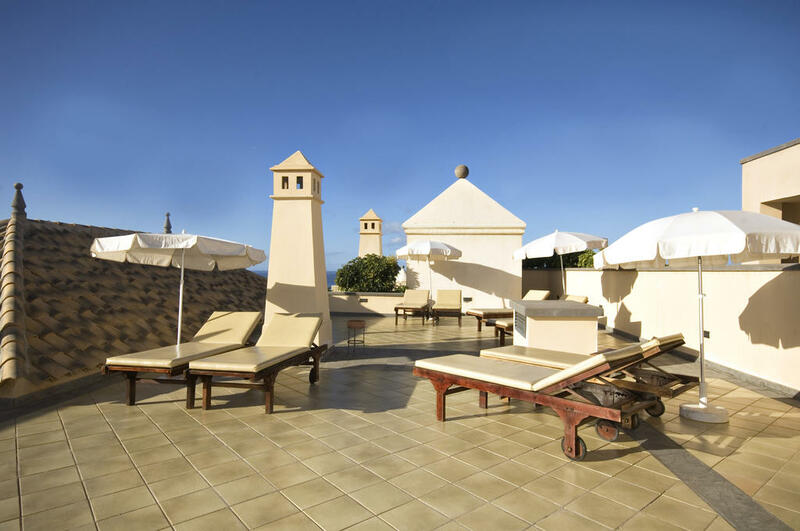 Identical characteristics as the Royal Suite, with a spiral staircase leading to a private terrace with jacuzzi. Minimum occupancy 4 adults, maximum 4 adults and two children. 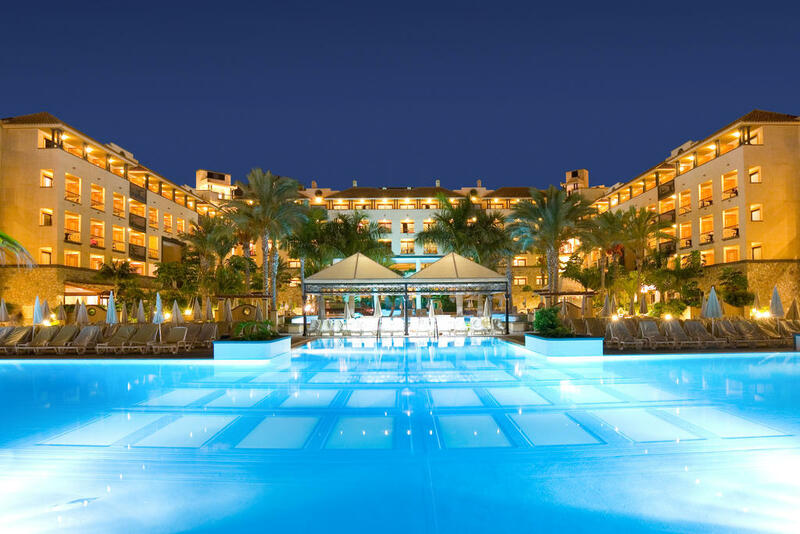 Costa Adeje Gran Hotel will identify guests on AI basis with bracelets which are of different colours for children less than 18 years and for adults. These colours of bracelets change and rotate in three different colours throughout the year. Hotel will not serve drinks to present external guest or guest having a different board basis. Drinks will not be served to take outside the Hotel. 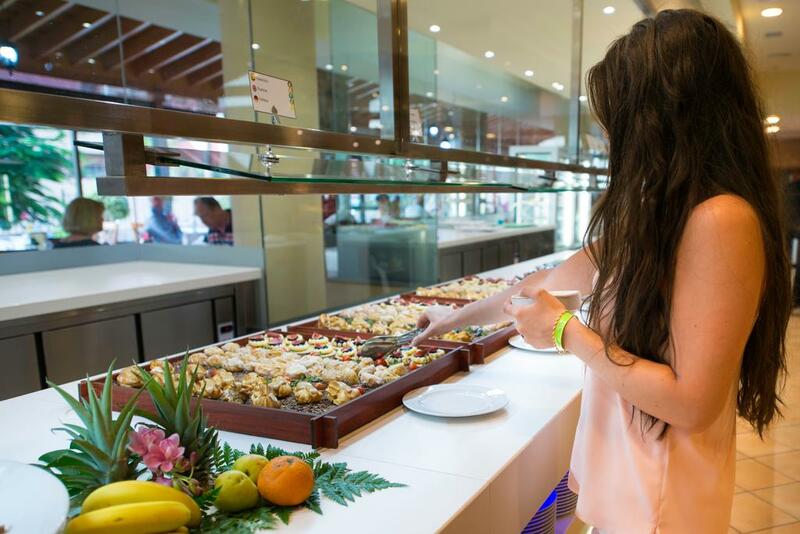 Breakfast: 7:30 to 10:30 in Restaurant Buffet La Finca. 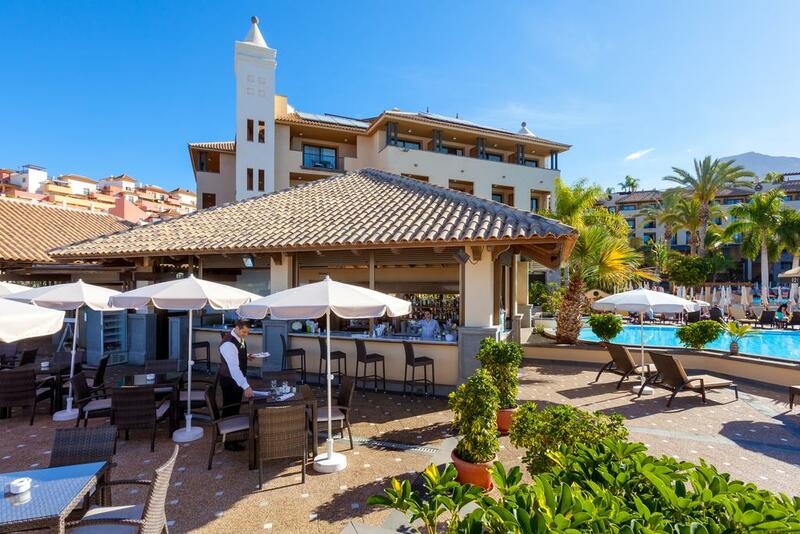 Lunch: 13:30 to 15:30 in Restaurant Buffet La Finca. Dinner: 18:30 to 21:30 in Restaurant Buffet La Finca. Drinks included at lunch and dinner: water, juices, soft drinks, Dorada beer (also non-alcoholic), white wine, red wine and rose wine (house wine). A discount of 40% will be applied to any other drinks you order from the Restaurant list. (Hotel may change the location of meals to any other hotel restaurant. At this point client will be previously informed). Picnic reserve with one day in advance before 8 p.m. The Pool Bar: Open from 10.00 till 18.30 Selection of drinks. From 10:30 to 18:30 self-service food. 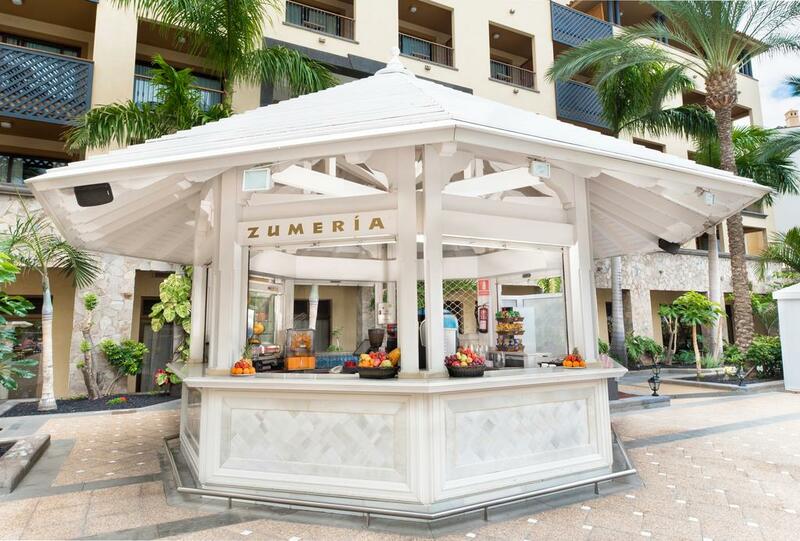 The Zumería Bar: Open from 10.30 to 18.00. Selection of drinks. The “All Inclusive” drink-list; some of these drinks may be subject to supplements. And from 18:30 to 23:00 ham and cheese sandwiches, pastries and a selection of ice creams. La Laja, our a la carte Restaurant: open from 19:00 to 22:30 (Wednesday & Thursday closed). Suggestive and varied Menu. The right place celebrations or just a different evening. Supplement 15.00€ per person. Drinks included in this restaurant: water, juices, soft drinks, Dorada beer (also non-alcoholic), white wine, red wine or rose wine (house wine). A discount of 40% will be applied to any other drinks you order from the Restaurant wine´s list. During the schedules stated above, the client will have access to all the drinks and ice cream (corresponding to All Inclusive board).The client will be given a menu stating the drinks included in the AI board as well as the rates for the other drinks (not included in the AI board), in case the client wishes to drink something which is not mentioned on the AI list. Drinks are served by the waiters on table, both in Restaurant and Bars. Sports: Activities organized by our animation team. Tennis, basketball, football, table tennis, squash, paddle or mini golf. All of them free of charge (Deposit between 10€ -20€ will be required for the equipment)). WI-FI: free in all Hotel. Important: The All Inclusive services are only the ones described in this information sheet. Any other service that request will have a fixed price and conditions. 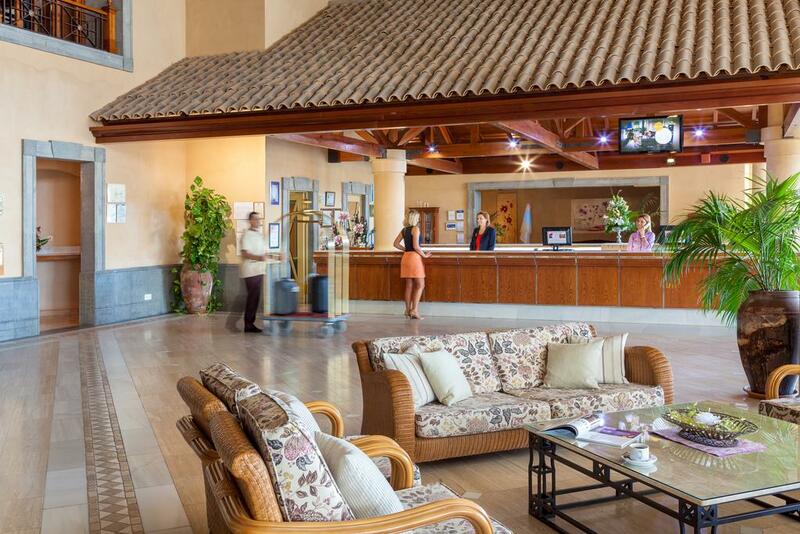 All Inclusive guests can not benefit from any other offers or promotions organized by the Hotel.